The latest prompt from the Big Book O’ Photo Prompts is: Color! Any of them. All of them, I suppose. So it’s time to check out a bit of street art. 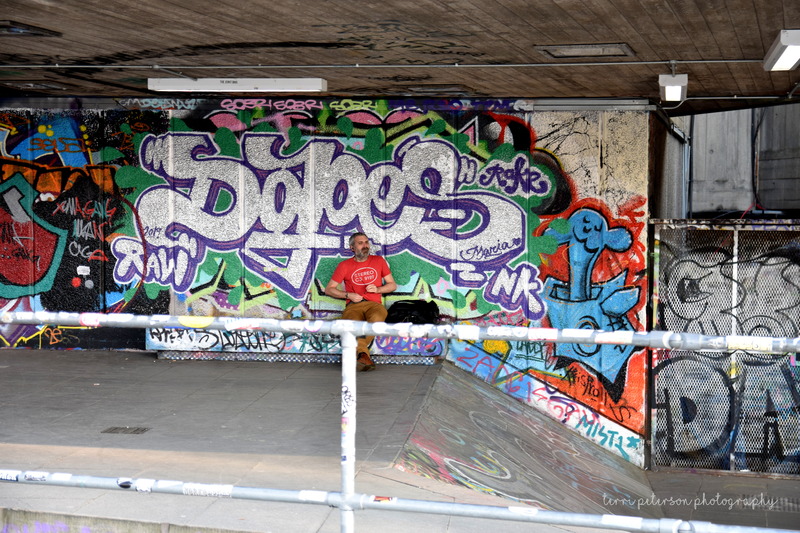 Built into the undercroft of the Queen Elizabeth Hall on London’s thriving South Bank district is a decades-old skate park. Built more than 40 years ago, the skate park has become a 24-hour creative space, used not only by skaters, but as an open-air workout space by other athletes, by photographers, and by artists. The Undercroft is also a graffiti tunnel, covered in an ever-changing mural of street art. Like London, it is vibrant and clever and diverse. Nevertheless, one really ought to pay attention to where one sits. Just read the wall, friend. That’s all.